Your driveway should be so much more than a parking place for your car, or an entry point to your garage. It needs to be a design feature. Remember, first impressions count, and kerb appeal can make or break your house’s value. Your driveway is an essential part of this kerb appeal, so use this guide to create a truly awesome driveway design. Exposed aggregate is a premium concrete option that offers incredible functionality and design possibilities. By exposing the aggregate in the mix, you end up with a textured, sandy aesthetic that is endlessly interesting. The other advantage of exposed aggregate is that it is durable, non-slip and the design actually works to hide stains, making it perfect for such a high traffic area. Coloured concrete offers all the things you love about concrete – longevity, low-maintenance and economical – while providing incredible stylistic choice. You can literally colour your concrete in whatever shade you like. With concrete paint, that slab of grey turns into a blank palette for you to whip up a masterpiece. Go bold with deep reds or go blue for elegance – the choice is yours. If you really want to turn up the style when it comes to your driveway, you should consider stamped concrete. This technique allows you to texture your concrete and recreate high-end looks like slate, tile and marble. Of course, because you’re using concrete you can create these looks without having to come up with the money that these materials require. You’ll also avoid a lot of maintenance because you won’t have to clean and replace grout, repair cracked tiles and deal with weeds poking out between pieces. Similar to stamped concrete, in that this technique allows you to recreate the look of other materials. With a combination of stencilling and concrete paint, you can mimic the look of anything from brick, to slate and bluestone. You can even create a design entirely of your own – if you want to create a coat of arms for your family home, go for it! You can even use it with plain concrete to create a border. Slate concrete driveways offer the ultimate in high-end elegance and durability. Slate has always been a favourite in Aussie home design, and there’s nothing quite like the luxury this moody material offers. Of course, by combining it with concrete, you can reduce the total cost and ensure it has the strength to withstand the repeated crunch of your car’s wheels. The design of your driveway needs to match the design scheme of your property’s frontage. So, if you have a modern-styled home, with lots of rendering and bold colours, you need to go for a different look than if you’re choosing a driveway to match a period or heritage-style home. Heritage Cottage: You need to stay away from bold colours here, so exposed aggregate, dark coloured concrete or even slate concrete will work best. Plain concrete with stencilled brick edging would also work well. Classic Brick Home: The beauty of red brick is that it looks good with most driveway designs, although lighter colourings will look the best as it will contrast beautifully with brick. Avoid slate, as the dark colours will clash and create an unpleasant visual. Homestead: If you’ve got a large, homestead style home, chances are you’ll need a big driveway. If that is the case, plain concrete with a stencilled bordering or exposed aggregate will be the most economical options. If you want a high-end prospect, use stamping to create a bluestone look and give yourself the perfect Melbourne entrance. Modern: Go bold to create a striking modern driveway design. Purple coloured concrete or even black concrete will look great with rendering. You can also use stencilling and stamping to recreate marble or sandstone for a high-end look. The most critical aspect of driveway design is perfecting the pour. Pouring concrete is an art, and if it isn’t done right, you can expect crack after crack and the need for almost constant repairs and maintenance. If you want it done right, make sure you get a professional, like the team at Everlast Services! 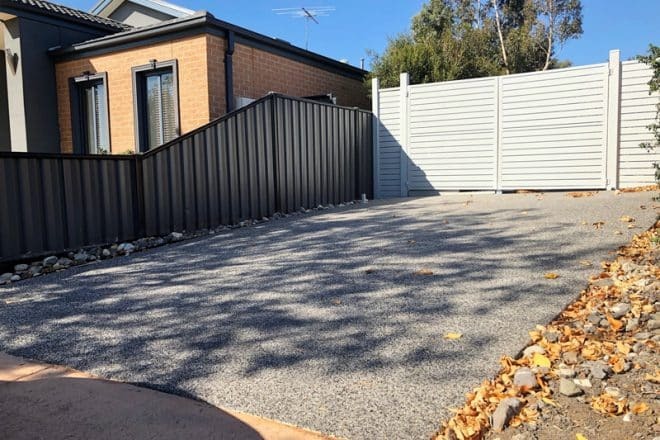 You can take advantage of our massive range of home improvement services and get fencing, landscaping and much more to top off our driveway design.